Definition at line 186 of file lldbstrings.h. Definition at line 185 of file lldbstrings.h. Definition at line 96 of file lldbstrings.h. Definition at line 95 of file lldbstrings.h. Definition at line 205 of file lldbstrings.h. Referenced by LLPanelGroupVoting::impl::processGroupActiveProposalItemReply(), LLGroupMgr::processGroupMembersReply(), and LLPanelGroupVoting::impl::processGroupVoteHistoryItemReply(). Definition at line 204 of file lldbstrings.h. Definition at line 104 of file lldbstrings.h. Definition at line 103 of file lldbstrings.h. Definition at line 108 of file lldbstrings.h. Definition at line 107 of file lldbstrings.h. Definition at line 217 of file lldbstrings.h. Definition at line 216 of file lldbstrings.h. Definition at line 124 of file lldbstrings.h. Referenced by LLFloaterNewIM::addAgent(), LLAvatarTracker::addBuddyList(), LLNameListCtrl::addElement(), LLNameListCtrl::addNameItem(), LLPanelLandObjects::callbackReturnOwnerObjects(), LLViewerParcelMgr::deedLandToGroup(), LLPanelEvent::draw(), LLFloaterChat::getAvatarName(), LLTrustNet::getScoreData(), LLCacheName::importFile(), LLNotifyBox::LLNotifyBox(), mean_name_callback(), LLIMMgr::noteOfflineUsers(), LLPanelFriends::onClickIM(), LLPanelFriends::onClickModifyStatus(), LLPanelFriends::onClickRemove(), LLPanelLandObjects::onClickReturnOtherObjects(), LLPanelLandObjects::onClickReturnOwnerObjects(), process_script_dialog(), LLFloaterAvatarPicker::processAvatarPickerReply(), LLAvatarTracker::processChange(), LLPanelDirBrowser::processDirPeopleReply(), LLAvatarTracker::processNotify(), LLSelectMgr::processObjectPropertiesFamily(), LLCacheName::Impl::processUUIDReply(), LLFloaterAvatarTextures::refresh(), LLFloaterProperties::refreshFromItem(), LLSelectMgr::selectGetCreator(), LLSelectMgr::selectGetLastOwner(), LLSelectMgr::selectGetOwner(), LLNameEditor::setNameID(), LLNameBox::setNameID(), LLPanelGroupMembersSubTab::updateMembers(), and LLHoverView::updateText(). Definition at line 123 of file lldbstrings.h. Definition at line 120 of file lldbstrings.h. Referenced by process_chat_from_simulator(), process_improved_im(), process_script_question(), and LLIMInfo::unpackMessageBlock(). Definition at line 119 of file lldbstrings.h. Definition at line 71 of file lldbstrings.h. Referenced by LLGroupMgr::processGroupPropertiesReply(), and LLGroupMgr::processGroupRoleDataReply(). Definition at line 70 of file lldbstrings.h. Definition at line 57 of file lldbstrings.h. Referenced by LLNameListCtrl::addElement(), LLNameListCtrl::addGroupNameItem(), process_script_dialog(), LLAgent::processAgentDataUpdate(), LLAgent::processAgentGroupDataUpdate(), LLPanelAvatar::processAvatarGroupsReply(), LLPanelDirBrowser::processDirGroupsReply(), LLGroupMgr::processGroupPropertiesReply(), LLGroupMgr::processGroupRoleDataReply(), LLCacheName::Impl::processUUIDReply(), LLFloaterProperties::refreshFromItem(), LLPanelLandAccess::refreshNames(), LLNameEditor::setNameID(), LLNameBox::setNameID(), and LLHoverView::updateText(). Definition at line 58 of file lldbstrings.h. Definition at line 56 of file lldbstrings.h. Definition at line 91 of file lldbstrings.h. Definition at line 92 of file lldbstrings.h. Definition at line 89 of file lldbstrings.h. Definition at line 90 of file lldbstrings.h. Definition at line 62 of file lldbstrings.h. Definition at line 61 of file lldbstrings.h. Definition at line 66 of file lldbstrings.h. Definition at line 65 of file lldbstrings.h. Definition at line 77 of file lldbstrings.h. Referenced by LLAgent::processAgentDataUpdate(), LLPanelAvatar::processAvatarGroupsReply(), LLGroupMgr::processGroupMembersReply(), LLGroupMgr::processGroupPropertiesReply(), LLGroupMgr::processGroupRoleDataReply(), and LLGroupMgr::processGroupTitlesReply(). Definition at line 76 of file lldbstrings.h. Definition at line 215 of file lldbstrings.h. Definition at line 214 of file lldbstrings.h. Definition at line 86 of file lldbstrings.h. 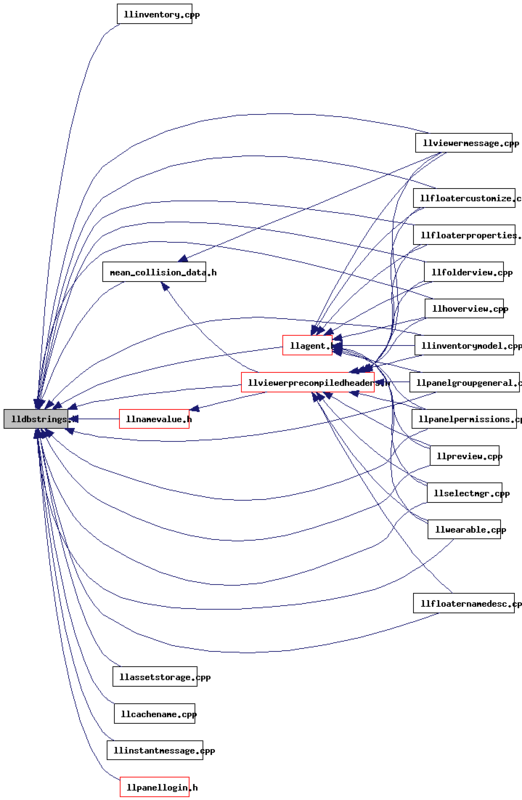 Referenced by LLViewerChatterBoxInvitation::post(), process_improved_im(), and LLIMInfo::unpackMessageBlock(). Definition at line 85 of file lldbstrings.h. Definition at line 53 of file lldbstrings.h. Referenced by LLSelectMgr::processObjectProperties(), LLSelectMgr::processObjectPropertiesFamily(), and LLInventoryItem::unpackMessage(). Definition at line 52 of file lldbstrings.h. Referenced by LLWearable::importFile(), LLFloaterNameDesc::postBuild(), LLFloaterImport::postBuild(), and LLAssetInfo::setDescription(). Definition at line 47 of file lldbstrings.h. Referenced by LLNotifyBox::LLNotifyBox(), process_improved_im(), process_script_dialog(), LLSelectMgr::processObjectProperties(), LLFloaterEventLog::processObjectProperties(), LLSelectMgr::processObjectPropertiesFamily(), LLFloaterEventLog::processObjectPropertiesFamily(), LLInventoryCategory::unpackMessage(), and LLInventoryItem::unpackMessage(). Definition at line 46 of file lldbstrings.h. Referenced by LLFileUploadBulk::handleEvent(), LLWearable::importFile(), LLInventoryObject::importLegacyStream(), LLFolderView::LLFolderView(), LLInventoryObject::LLInventoryObject(), LLAgent::makeNewOutfit(), LLFloaterNameDesc::postBuild(), LLFloaterImport::postBuild(), LLInventoryObject::rename(), LLAgent::saveWearableAs(), LLAssetInfo::setName(), upload_done_callback(), and LLNewAgentInventoryResponder::uploadComplete(). Definition at line 128 of file lldbstrings.h. Referenced by LLFloaterNewIM::addAgent(), LLAvatarTracker::addBuddyList(), LLNameListCtrl::addElement(), LLNameListCtrl::addNameItem(), LLPanelLandObjects::callbackReturnOwnerObjects(), LLPanelEvent::draw(), LLTrustNet::getScoreData(), LLCacheName::importFile(), LLNotifyBox::LLNotifyBox(), mean_name_callback(), LLIMMgr::noteOfflineUsers(), LLPanelFriends::onClickIM(), LLPanelFriends::onClickModifyStatus(), LLPanelFriends::onClickRemove(), LLPanelLandObjects::onClickReturnOtherObjects(), LLPanelLandObjects::onClickReturnOwnerObjects(), process_script_dialog(), LLFloaterAvatarPicker::processAvatarPickerReply(), LLAvatarTracker::processChange(), LLPanelDirBrowser::processDirPeopleReply(), LLAvatarTracker::processNotify(), LLSelectMgr::processObjectPropertiesFamily(), LLCacheName::Impl::processUUIDReply(), LLFloaterAvatarTextures::refresh(), LLFloaterProperties::refreshFromItem(), LLSelectMgr::selectGetCreator(), LLSelectMgr::selectGetLastOwner(), LLSelectMgr::selectGetOwner(), LLNameEditor::setNameID(), LLNameBox::setNameID(), LLPanelGroupMembersSubTab::updateMembers(), LLFloaterBuyLandUI::updateNames(), and LLHoverView::updateText(). Definition at line 127 of file lldbstrings.h. Definition at line 112 of file lldbstrings.h. Definition at line 111 of file lldbstrings.h. Definition at line 162 of file lldbstrings.h. Definition at line 161 of file lldbstrings.h. Definition at line 197 of file lldbstrings.h. Definition at line 198 of file lldbstrings.h. Definition at line 200 of file lldbstrings.h. Definition at line 199 of file lldbstrings.h. Definition at line 201 of file lldbstrings.h. Definition at line 191 of file lldbstrings.h. Definition at line 192 of file lldbstrings.h. Referenced by LLPanelClassified::processClassifiedInfoReply(), LLPanelDirBrowser::processDirClassifiedReply(), and LLPanelPick::processPickInfoReply(). Definition at line 228 of file lldbstrings.h. Definition at line 229 of file lldbstrings.h. Referenced by LLPanelClassified::processClassifiedInfoReply(), and LLPanelPick::processPickInfoReply(). Definition at line 224 of file lldbstrings.h. Definition at line 225 of file lldbstrings.h. Referenced by LLPanelAvatarClassified::processAvatarClassifiedReply(), and LLPanelAvatarPicks::processAvatarPicksReply(). Definition at line 195 of file lldbstrings.h. Definition at line 196 of file lldbstrings.h. Definition at line 189 of file lldbstrings.h. Definition at line 190 of file lldbstrings.h. Definition at line 213 of file lldbstrings.h. Definition at line 212 of file lldbstrings.h. Definition at line 178 of file lldbstrings.h. Definition at line 177 of file lldbstrings.h. Definition at line 100 of file lldbstrings.h. Definition at line 99 of file lldbstrings.h. Definition at line 209 of file lldbstrings.h. Definition at line 208 of file lldbstrings.h. Definition at line 140 of file lldbstrings.h. Definition at line 139 of file lldbstrings.h. Definition at line 136 of file lldbstrings.h. Definition at line 135 of file lldbstrings.h. Definition at line 145 of file lldbstrings.h. Definition at line 144 of file lldbstrings.h. Definition at line 220 of file lldbstrings.h. Definition at line 221 of file lldbstrings.h. Definition at line 132 of file lldbstrings.h. Definition at line 131 of file lldbstrings.h. Definition at line 150 of file lldbstrings.h. Definition at line 149 of file lldbstrings.h. Definition at line 158 of file lldbstrings.h. Definition at line 157 of file lldbstrings.h. Definition at line 154 of file lldbstrings.h. Definition at line 153 of file lldbstrings.h. Definition at line 173 of file lldbstrings.h. Definition at line 174 of file lldbstrings.h. Referenced by LLPanelGroupVoting::impl::processGroupActiveProposalItemReply(), and LLPanelGroupVoting::impl::processGroupVoteHistoryItemReply(). Definition at line 166 of file lldbstrings.h. Definition at line 165 of file lldbstrings.h. Definition at line 170 of file lldbstrings.h. Definition at line 169 of file lldbstrings.h. Definition at line 82 of file lldbstrings.h. Definition at line 81 of file lldbstrings.h.